Bonnie McGrew is a retired sales clerk. Jesse Owens is a professor. Nathan Carey is an athlete. They all have something in common: at some point in their lives, each has lost the ability to walk, and had to adjust to life in a wheelchair. "Emotionally, it does a lot to a person," said McGrew. When she first started using a wheelchair in 2009, it was a manual chair that she wasn't strong enough to push. "Not having my freedom, of being able to go places, it was hard on me," she said. "I had to be dependent on people to get around. It was really hard to deal with." It was the farther reaches of Alaska's outdoors that Owens missed the most. "In my opinion, the ability to get into wilderness and nature is one of the greatest losses of all, when you become wheelchair-bound," he said. Carey was a running back on a football scholarship in 2008 and was working a summer job when a crate carried on a forklift fell on him, fracturing one of the lower vertebrae of his spine. He finished his degree in sports management and marketing, but life in a wheelchair has entailed a radical exploration of the 24-year-old's vocation. The 6th session of the Conference of States Parties to the Convention on the Rights of Persons with Disabilities will take place from 17-19 July 2013. A day prior to the Conference a Civil Society Forum will be held on 16 July. Montréal, June 4th, 2012 - The number of international tourist arrivals is expected to climb to one billion in 2012. Persons with physical limitations account for roughly 15% of the population and this number should continue to rise given the aging demographic. Like everyone else, people with disabilities travel for business and pleasure, to visit friends and relatives, and to discover other ways of life, just with slightly greater difficulty. How do we accommodate tourists with disabilities? Are our infrastructures, buildings and establishments adapted to be easily accessible to all? Can we safely aspire to reach international accessibility standards and benchmarks? Do "accessible" rooms in Montréal and elsewhere around the globe live up to the world traveller's expectations? How can a disabled person be sure his or her chosen destination is truly accessible? Is our front-line staff properly trained to host these guests and provide appropriate services? Which best practices from the tourism, culture and transportation industries should be considered model practices? What measures should these industries take to substantially facilitate the participation of individuals with disabilities in cultural and tourist activities? Those are just some of the questions that will be discussed at the DESTINATIONS FOR ALL World Summit that is set to take place in Montréal from October 19 to 22, 2014. In fact, the major sector-based organizations from the tourism, culture and transportation industries will be invited to unveil at least two changes they undertake to make to significantly improve travel and tourism conditions for persons with disabilities. This World Summit should also prompt partners to join in an effort to make accessibility benchmarks and standards uniform across tourist establishments, attractions and transportation services. The International Center for Education and Research in Tourism (CIFORT) will hold, simultaneously, a scientific seminar regarding the Summit's thematic. "At a time when the population of the Western world is aging and international tourism continues to grow, it is crucial for domestic and global partners to consolidate their expertise and join forces to make travel and tourism easier for disabled persons." "Promoting accessible tourism is at the heart of UNWTO's mandate and we are delighted to be an active part of the DESTINATIONS FOR ALL World Summit in Montréal. Through the Global Code of Ethics for Tourism, UNWTO is committed to upholding the rights of the most vulnerable communities, particularly the elderly and the disabled. I firmly believe the Summit will be an opportunity to come up with solutions to considerably improve travel, accommodation and accessibility conditions across tourist attractions and services for persons with disabilities." "The World Summit is assembling leading organizations to foster cooperation among stakeholders through the accessibility of destinations. I would like to pay tribute to the efforts made by Kéroul, an official partner of the Ministère du Tourisme for the past 25 years, which is working intensely to make Québec a destination accessible to everyone." Without question, the DESTINATIONS FOR ALL World Summit in Montréal is an event ALL are invited to attend! For event details, please check the site Trang web cá cược trực tuyếnwww.keroul.qc.ca/en regularly and sign up to our newsletter. World Tourism Organization. "International tourism to reach one billion in 2012." Press Release of January 16, 2012. Madrid. It is obviously difficult to determine the exact number of persons with limited physical ability by country and worldwide, because the definitions and calculation methods vary. We came up with this figure based on the findings of several studies. G3ict - The Global Initiative for Inclusive Information and Communication Technologies and E.J. Krause and Associates invite you to participate in the M-Enabling Summit 2013 to be held June 6-7, 2013 in Washington, D.C. in cooperation with the Federal Communications Commission (FCC). The Summit will open with a session on Universal Access for All Ages and Abilities followed by a panel on Making Mobile Communications Work for Users of All Abilities underlining the major opportunities offered by new accessibile mobile solutions. The two day high-level conference and showcase will be entirely dedicated to mobile communications and services for senior citizens and persons of all abilities. The conference will review the considerable advances in mobile accessibility achieved by industry and apps developers, their adoption by users and how leading organizations from around the world promote them with new programs and partnerships.The Summit, supported by major disability and senior organizations, as well as industry associations and the private sector, is expected to attract hundreds of participants from more than 40 countries, reflecting the global scope of new mobile opportunities for users and app developers alike. The program will focus on the latest accessibility innovations featuring 150 key industry speakers, private sector leaders, app developers, policy makers, mobile accessibility experts and disability advocates sharing their experience. Specialized sessions will focus on themes such as new mobile apps and services promoted by the 21st Century Communications and Video Accessibility Act (CVAA), cloud solutions for mobile users, mobile solutions for multi-media accessibility, as well as latest mobile innovations addressing specific industries and areas of disability and barriers to usage for seniors. Confirmed presenters include representatives from leading organizations of persons with disabilities and senior citizens, such as the International Disability Alliance (IDA) and Disabled Peoples' International (DPI), as well as executives of the International Telecommunication Union (ITU), the Consumer Electronics Association (CEA), CTIA-The Wireless Association, the Telecommunications Industry Association (TIA), the World Wide Web Consortium (W3C), the Mobile Manufacturers Forum (MMF) alongside with AT&T, Sprint, T-Mobile, Adobe Systems, Microsoft, BlackBerry, Orange, Deque Systems, Freedom Scientific, IBM, Code Factory, Intuit, Apps4Android and a number of developers of mobile enabled accessibility solutions. As the reliance on mobile applications, technology and services continues to impact nearly all facets of daily life, the M-Enabling Summit is a must attend event for any organization interacting with senior citizens and persons with disabilities, a group representing 54 million individuals in the United States and growing, as the populations ages. WASHINGTON, DC., March 19, 2013 (U.S. Travel Association Media Release) - Overseas travelers are avoiding the United States due to lengthy and inefficient customs and entry procedures at the nation's gateway airports according to a new survey released today by Consensus Research Group and the U.S. Travel Association. By experience and word of mouth, at least 100 million overseas travelers are receiving the message to avoid travel to the U.S. - costing the economy at least $95 billion in total output and 518,900 jobs. "Too many visitors to our country - one in three - report that they have experienced a Customs process that they believe is inconsistent, inefficient or confusing," said Roger Dow, president and CEO of the U.S. Travel Association. "As the U.S. spends millions to recapture the world's interest and inspire international travelers to visit, we are failing to address a galling entry experience that is driving 43 percent of our guests to tell others to avoid travel to our country." Prior to sequestration budget cuts, prominent gateway airports reported two-to-three hour waits to clear U.S. Customs and Border Protection (CBP). Homeland Security Secretary Janet Napolitano has stated publicly that those waits are likely to grow as CBP eliminates overtime and furloughs agents. Like all other years, this year's Railway budget did not bring any cheer for India's 70-100 million people with disabilities, a large number of whom depend on the Railways for their basic mobility needs. The only difference was that for the first time, the new Railway Minister talked about the substantive issue of accessibility at the stations and in the coaches. However, the discrimination and indignity faced by millions of persons with disabilities trying to use the Railways cannot be addressed by mere pious statements of good intent. The barriers are deep-rooted and systemic. Let's try and understand what it means for the average person with disability to travel with the Railways. To begin with, you can't buy the tickets online. The website is not accessible as it does not conform to web content accessibility guidelines despite a Government of India policy mandating so. And even if you are not print-impaired, you 'have to' physically go to the booking counter with your disability certificate in hand to avail yourself of the discount and get a prized seat in that one single accessible coach per train. The booking counters are not accessible and that one 'accessible' counter for 'special' and 'differently-abled' people (pun intended) is not manned most of the time. To top it, by the government's own admission, more than 50 per cent of the people with disabilities actually don't have a disability certificate. Even if you are lucky to have a disability certificate, you are forced to purchase two tickets and to travel with an 'attendant,' never mind if you are totally independent and can actually travel alone. To get to the coach is another huge struggle. The way to the platforms is not at all accessible. India is still stuck with the concept of foot over-bridges with a thousand steep steps, and no ramps or lifts. You are therefore left with no choice but to use the same path as the luggage carts -- littered with potholes and garbage. The concept of 'accessibility' for the Railways has remained limited to one accessible toilet for the entire station. God help you if you urgently need to use one but you are on Platform No. 2 and the 'disabled-friendly' toilet happens to be at the extreme end of the station, beyond Platform No. 7. It is the same story with all other public facilities such as the drinking water taps, the public telephone booths, and so on. The worst aspect of the Railways in the modern, 21st century India is the segregated coach for people with disabilities. This 'special' coach for 'differently-abled' people is attached now to almost every long-distance train either at the beginning, immediately after the engine, or towards the very end, right next to the guard. A person with disability doesn't have the same choice as other passengers because all the other coaches are not accessible. We all know the story of Mahatma Gandhi having been thrown off a first-class carriage in South Africa because of the colour of his skin. I say Gandhiji was lucky. After all, he did manage to get into the coach. I, as a wheelchair user, can't even get inside. What is needed is a holistic, time-bound action plan with a generous resource allocation. We are not asking for any miracles but there should be a serious start somewhere. I offer a simple three-point agenda to our new Railways Minister: Make the Railways website accessible. Make all A1 category stations fully accessible (stations are categorised by passenger traffic). Make at least one coach accessible in every class of every train. Fix a practical time frame, allocate a decent budget and for God's sake, then just do it! As the body responsible for promoting and monitoring the implementation of the UNWTO Global Code of Ethics for Tourism, the Committee applauded the significant advancements in UNWTO's engagement with the private sector, as well as the 47 companies and associations which signed the Code between September 2011 and February 2013. These include major tourism associations from Germany, the Netherlands, Spain and Mexico, among others. "With their signature, these companies have pledged to implement and promote the Code's values, both by integrating ethical practices into their business operations, and by reporting to the World Committee on Tourism Ethics on the actions they undertake", said UNWTO Secretary-General, Taleb Rifai, in his welcome remarks to the participants. The Chairman of the World Committee, Dawid De Villiers, called for a renewed commitment to ethical standards and values, stressing that "we live in difficult times and peoples and nations around the world are facing enormous challenges". He explained that "the tourism sector can make a valuable contribution to peace and progress if all stakeholders commit themselves to the principles and values of the Global Code of Ethics for Tourism. The Code is our roadmap towards a better future". Accessibility is a key area of UNWTO's work in sustainable tourism development. Against this backdrop, the Committee also discussed the on-going updating of the 2005 UNWTO Recommendations on "Accessible Tourism for All". The revised Recommendations will be submitted for approval to the upcoming UNWTO General Assembly next August. Committee members also welcomed the production of a "Manual on Developing Universal Accessibility", a result of UNWTO's collaboration with the Spanish ONCE Foundation, the European Network for Accessible Tourism (ENAT) and the ACS Foundation, expected to be available later this year. Other issues discussed by the Committee included consumer protection, travel facilitation, sustainable tourism following Rio+20, intangible cultural heritage and fair tourism. Adopted in 1999 by the UNWTO General Assembly and endorsed by the United Nations General Assembly in 2001, the UNWTO Global Code of Ethics for Tourism (GCET) is a set of principles designed to guide the development of tourism in a way that maximizes the socio-economic benefits of the sector, while minimizing any negative impacts. The World Committee on Tourism Ethics is the impartial body responsible for interpreting, applying and evaluating the provisions of the GCET. A subsidiary organ of the UNWTO General Assembly, the Committee reports directly to the Assembly. Members are elected in their personal capacities and not as officials of governments or representatives of their countries. ComScore has produced a new study on key trends shaping the Brazilian dgital landscape." called "2013 Brazil Digital Future in Focus" The study overviews social media, search, online video, digital advertising, mobile and e-commerce. It reports that consumers in Brazil spent more than 27 hours per month online on their desktop computers, representing the highest average engagement of all 8 Latin American markets analyzed. A copy can be obtained here. A special section from Ability magazine on the market potential of people with disabilities. 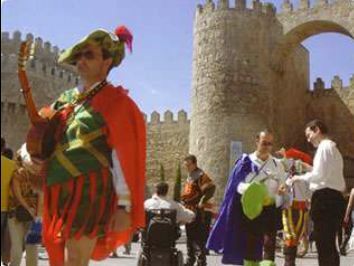 The ONCE Foundation for cooperation and inclusion of people with disabilities, invites you to participate in the IV International Congress of Tourism for All, which will be held in ávila, Spain, on 26, 27 and 28 June 2013. The World Tourism Organization (WTO), the European Network for Accessible Tourism (ENAT), the European Institute of Design for All (EIDD) and the Ministry of Industry, Tourism and Trade are collaborating in this event. The Congress is aimed at administrations, companies and users of products and services linked to tourism, as well as at all those people and institutions interested in knowing the current and future state of Tourism for All. This IV International Congress on Tourism for All will have as its central focus the Cultural and Historical Heritage. It is intended for all professionals of culture, with the aim of enhancing their participation in the tourism sector and the objective of establishing the Accessibility and Design for All, thus promoting the inclusion of people with special needs. To make the tourism sector aware on the need to establish strong guidelines for Design for All and Universal Accessibility. To know and disseminate examples of good practices of Tourism for All. To show the profitability of the proposals of Accessible Tourism to the sector. To unify criteria of accessibility in Tourism for All. To enhance the role of culture as a source of tourist resources. To consider the elaboration of realistic and rigorous technical projects that facilitate the conversion of cultural potential into tourism products tailored to everyone′s needs. To show the employment opportunities for people with disabilities within the growing development of cultural tourism. To raise awareness of the need to achieve full accessibility of culture for the progress and development of our society, where a greater visibility and an active participation of people with disabilities will be a reality. To achieve a greater participation of cultural actors in the tourism industry for all. In an effort to strengthen the impact of the UN guidelines, ensure that information is disseminated and that local disability policy planning adheres to the principles outlined in the 22 provisions of the Standards Rules, the Swedish Disability Federation in 1996 created a method for implementing these rules called Agenda 22. At first, local authorities were targeted since often they are the ones responsible for services such as housing, education and medical care, which impact the daily life of people with disabilities. More recently, the aim of Agenda 22 has been to assist authorities on all different levels in society to draw up strong disability policy plans based on the Standard Rules. According to Maryanne Ronnersten of the Swedish Disability Federation (HSO) Agenda 22 is "built on the conviction that systemic planning is the most effective way to eliminate all the obstacles that persons with disabilities meet." Founded on certain principles, including: the equal worth and rights of people with disabilities; the idea that people are different and therefore have different needs of support from society and that those supports are not a privilege but a right; and, finally, that organizations of people with disabilities must be accepted as experts in matters that affect their life, Agenda 22 consists of three parts. Includes a method of evaluation and review. The second part highlights the importance of equal-partner organizations, namely that representatives from organizations of people with disabilities should take part in every aspect of any process that affects them, from planning to the final product. The third part focuses on methods of working (i.e., ways to move from an idea to an actual plan). In order to accomplish this, two different inventories must be taken. First, certain questions need to be answered, including: What is the current situation for people with disabilities? What resources are available from governmental authorities? And, how do authorities live up to the UN Standard Rules at present? Second, an inventory must be made of the kinds of public services people with disabilities need. These surveys are best carried out by directly communicating with the local community. The in end, proponents of Agenda 22 hope that by creating a framework, where the community and the local authority work together to assess the current situation, available resources and needed services, comprehensive and effective disability policy plans based on the Standard Rules will be developed. 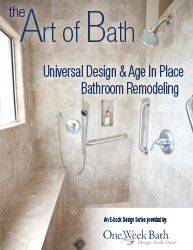 The Art of Bath: Universal Design & Age in Place Bathroom Remodeling. As a longtime home builder and lead construction consultant for ABC's Extreme Makeover: Home Edition, Matt saw firsthand what having an attractive and accessible bathroom can mean for a person with physical limitations. In 1999 he developed the One Week Bath model. While the company does not focus solely on Universal Design and Age in Place construction, they've seen an increase in the number of people interested in these concepts. Ensure your website address is listed in the About section of your Timeline/Page in order to provide an easy point of entry to more information. Include other ways to contact your organization, such as your 800 number, an online "Contact Us" form, or general contact email address for more information. Always provide a link back to a .gov page that hosts a copy of the photo, video, or audio with full caption/transcript. After posting the photo, video, or audio, immediately post a comment that directs users to the full caption or the full transcript. If you have a YouTube channel, upload your video to your channel and make sure you enable closed-captions (you'll want to upload your own transcript to make sure the captions are accurate). Then post a link to your YouTube video as your status update, rather than uploading the video into Facebook. This will ensure that visitors will be taken to your accessible version on YouTube. Facebook provides ample space that allows you to spell out acronyms. Spell out the first instance of the acronym and add the acronym in parentheses after (e.g., U.S. Geological Survey (USGS)). This is especially helpful for those using screen readers, because after the name is heard the acronym is spelled out, and the user will associate the sound of the acronym with the full name. Put your 800 number in your bio line. If you don't have a number, put a link to your accessible "Contact Us" form. If you don't have a "Contact Us" form, put an email link to someone who can provide help for those with questions. Put the following prefixes before tweets that have photos, videos, or audio. This allows people using screen readers to know what to expect before it's read out loud. The uppercase formats are for further clarity to sighted users. Link back to the page that has a copy of the photo, video, or audio with full caption/transcript. Make your tweet serve as a descriptive caption so it has context for the item and then link back to your .gov for full accessibility. Use the Twitter API or Embedded Timelines feature to display your agency's tweets on your .gov site. Add a link in your bio, or occasionally tweet that you have an accessible format of your tweets at [provide link]. Try to place any hashtags or @mentions at the end of the tweet. This allows a screen reader to voice the main content of the tweet more clearly in the beginning, and saving the service-specific speak for the end (the parts that sound confusing). If possible, avoid using unfamiliar acronyms that would sound strange if read by a screen reader. If space allows, try to spell out the acronyms instead or use a different way to convey the information. If the acronym is well-known and sounds the same when we speak as it's intended to sound (e.g., NASA), you don't need to spell out "National Aeronautics and Space Administration". Use "CamelCase" for multiple words for hashtags; that is, capitalize the first letters of compound words (use #SocialGov not #socialgov). If possible, use the audio feature on your phone to listen to your tweet prior to distribution so you know now your message would be conveyed to a hearing-impaired person. 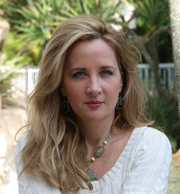 Deborah Davis is the co-founder of PUSHliving.com, a travel, leisure and lifestyle enterprise that is also the parent company for the travel resource site TravAbility.travel. Deborah is now very excited to announce PUSHliving's newest, and possibly her most significant, venture to date PhotoAbility.net With the inspiration that comes from PhotoAbility, Deborah feels she has entered into a "revival" phase of her life. This period of rebirth came about after her previous life, as she had known it, drastically and suddenly changed. Her two beautiful girls left the nest, bound for college. She had married a man that was rarely in the country due to work-related travel, so she was most often alone. Deborah had to retire from a full-time 20-plus-year professional career due to what she described as a full-blown rebellion by her body. This came as a result of number of years in chair (result of car accident at 18), extreme fatigue and what her doctor referred to as "overuse syndrome" affecting her ability to use her hands and arms. The thought of one day possibly losing her ability to maintain her independence was terrifying. Her life went from a fast-paced, frantic juggling of work and family responsibilities to an empty home and a lot of time for self-reflection. TORONTO, MARCH 22, 2013 -- /PRNewswire/ -- eSSENTIAL Accessibility launched a new magazine, MarketAbility: Your Guide to the Disability Marketplace, which caters to the people with disabilities community. MarketAbility features news and stories targeted to people with disabilities in North America. The eight-page inaugural issue focuses on inclusive travel and hospitality, with short and engaging articles about people with disabilities who are breaking down barriers to leisure and adventure travel, as well as expert analysis on the future of the inclusive travel market. En Route with Scott Rains interviews Scott Rains, a seasoned traveler who is paralyzed, who travels around the world consulting with businesses and governments around the economic value of inclusive tourism and how to make cities, hotels, sporting events like the World Cup--and even safaris--more accessible for people with disabilities. Leading the Way: A Disability Travel Report reveals the annual spend of travelers with disabilities, discusses their unique needs, and highlights the airlines, hotels and theme parks that are pioneers in making tourism and travel more inclusive for people with disabilities. Return on Disability Index spotlights a Bloomberg-listed stock index that measures companies on specific disability benchmarks. U.S. travel companies in the index include Boeing, Carnival Cruise Lines, Marriott International, Royal Caribbean International, Southwest Airlines, Walt Disney Co., and Wyndham Hotel Group. NIKE races ahead with innovative disability ads talks about how the sports giant is one the few major brands to feature people with disabilities in its advertising, including double amputee Oscar Pistorious, who raced in the 2012 Olympics in London. In the U.S. there are 57 million Americans with disabilities, and there are 15 million people with disabilities in Canada, comprising a broad group across ages, ethnicities and interests. "The audience is out there--MarketAbility delivers real-life stories to inspire and empower the millions of consumers with disabilities," says Simon Dermer, Managing Director of eSSENTIAL Accessibility. "Through MarketAbility we give recognition to brands that are reaching and serving the disability and aging markets in innovative ways, and we're helping organizations discover new opportunities for creating loyalty in the people with disabilities marketplace." The inaugural edition of MarketAbility appears in Ability Magazine, an award-winning bi-monthly publication featuring celebrity interviews with an emphasis on health, disability and human potential. The February/March issue profiles actor William H. Macy. Future issues of MarketAbility, which will be published four to six times a year, will debut in a variety of consumer magazines where people with disabilities, and their families and friends, are likely to comprise a large audience. About eSSENTIAL Accessibility eSSENTIAL Accessibility helps leading brands build loyalty with the disabled consumer and employee segments. Organizations that feature the eSSENTIAL Accessibility icon signal their participation in a coalition of companies that are dedicated to serving the people with disabilities market to create economic and social value. For more information, please visit http://www.essentialaccessibility.com. Sponsored by the Equality and Human Rights Commission and VisitBritian The British Standards Institution (BSI) worked together with the Equality and Human Rights Commission (EHRC) and VisitBritain to develop a Publicly Available Specification (PAS) that standardizes the accessibility and services offered to disabled people or people with a long-term health condition in the UK by large hotel premises and hotel chains. by by Rosemarie Rossetti, Ph.D.
For the first time since my injury I can close the door in our home when I use the toilet. All toilets seats are 17 ?" from the floor. The 2 1/2 bathrooms were sized to accommodate wheelchairs with pocket doors, privacy panels and telescopic doors to ensure that the occupants have adequate space for any size wheelchair. My husband and I each have a home office at opposite ends of the house. Mark's office was built with a sound damping drywall and recycled cellulose wall and ceiling insulation to keep his conversations private. Both of our offices have art glass doors to ensure a quieter day. The home design considerations for me have not had a negative impact on Mark. Our home is usable and inclusive to people of various sizes and abilities. That's the beauty of universal design! Mark and I approached this project with a passion and dedication that has been with us since the idea was initiated. We have learned to persevere in spite of adversity and setbacks. We have met amazing people who have championed our cause and helped us along the way. By putting a team of architects, designers, marketing experts, public relations specialists, lawyers, manufacturer representatives, and construction managers together, we learned the importance of pre-planning and getting advice from a variety of people. As we look back and see the immense challenges we faced and financial investment we made, we turn our attention to the project's mission. Our home serves as a catalyst for change in the building and design industry. We are hopeful that our home makes a significant positive difference in people's lives and gives others hope. The cabinetry in the UDLL was contributed by KraftMaid. We selected their Passport series because of the 9" X 6" toekick. All cabinents were standard sizes and it was easy to have the kitchen cabinets made so there were multiple heights of countertops. Features include: full extension drawers in the wall cabinets and center island; large under counter drawers for dishes, pots and pans; pull out spice racks; pull out pantry cabinet; floor to ceiling narrow pantry shelves; pull out closest organizer for cleaning supplies/products; rolling cart for food preparation and serving. A Garaventa Lift,model Elvoron HR residential elevator, 42" wide X 60" deep, three stop elevator with automated clear acrylic accordion car gates; roped/hydraulic drive. This elevator was sized to hold a person using a power wheelchair or scooter and boxes. It is quiet and has self closing car gates allowing total independence to get from floor to floor. There is ample room to turn my manual wheelchair in a circle in the cab, as well as room for boxes that I transport with me. All plumbing fixtures including: toilets, sinks, faucets, and the step free shower stall at the UDLL were contributed by Kohler. The toilets are Comfort height providing an easy transfer and using only about a gallon of water. The sinks are stylish and allow me access for my knees. The hand held shower nozzle is light weight, and conserves water , yet is powerful in delivering water where you need it. The Freewill barrier-free shower stall was complete with the fold down shower bench, hand held shower nozzle and grab bars. As others plan to remodel or build a new home, they need to build in features that allow the occupants independence. Empowerment is a primary objective of a universal design home. Accessibility, safety, convenience and usability features need to be top of mind in the design phase. One example of a universal design feature is a no step entrance, a feature that was not present in my previous home. Previously I had to use a porch lift at the front door and was exposed to bad weather. Rolling into our new home is achievable independently at any entrance. The low door thresholds and wide doorways are especially appreciated. This allows me the ability to park my van in the garage and roll right into our home through a choice of three separate entrances. Guests in wheelchairs and walkers can park under the portico and easily roll to the front door. There are no steps anywhere in the home except those leading to the basement. There is an elevator to the basement and loft. My favorite room is the kitchen and the independence it's design and appliances offer. Visitors are most surprised when they see the side hinged oven in the center island. The microwave is located just left of the oven. This island has three countertop heights: 30 ? inches, 34 ? inches, 40 inches. The countertop by the sink and cooktop is 34 inches. The lowest section provides me access for food preparation, as well as enjoy a meal. Guests gravitate to the countertop height of their choice. The convenience electrical outlets on the center island are useful when plugging in small appliances. All light switches and electrical outlets are reachable from a seated position. More than 50 percent of the storage space is accessible from my wheelchair. The cooktop and sink have plenty of knee space underneath. The cooktop has three low profile modules consisting of three gas burners and an in-counter steamer/pasta cooker. Water in this cooker can be drained by turning a knob, so there's no risk of getting scalded. Having the deck-mount pot filler at the cooktop is convenient when filling the steamer and pots. The articulating swing spout offers clearance for filling pots and can be positioned out of the way when not in use. The lever handle is easy to operate. There is a control panel at waist height for the ventilation fan and light above the cooktop. The dishwasher is raised 15 inches off the floor and easy to utilize. The side-by-side refrigerator/freezer has full extension adjustable height shelves and drawers, reachable from a seated position. The 4 foot by 7 foot no step entry master shower is build for two. The adjustable height handheld shower nozzle that I use is on the wall to the left of my shower seat. This seat is mounted on the wall and is adjustable in height. The opposite wall has a stationary shower nozzle for Mark. We each have grab bars for safety. The heated tile floor is sloped allowing water to exit by way of the channel drain. The 42 inch wide doorway allows easy access for me in the wheelchair. The guest bedroom no step entry shower is a one-piece module with a built in fold-up seat, grab bars and adjustable handheld shower nozzle. The whirlpool bath tub has integrated grab bars on the sides and is surrounded by a wide deck at the same height as my wheelchair seat. I am able to transfer from my wheelchair to the deck and pivot my legs into the tub for an independent transfer. Doing laundry is no longer a frustrating experience as it was in our previous home. The wardrobe/laundry room is adjacent to the master bathroom. It contains a sink with knee space; pull out ironing board system; 34 ? inch high center island with drawers and hampers; full length mirror; hanging rods; and shelves for shoe and clothes storage. The washer and dryer are front loading and are on pedestals for great access. There is plenty of room for me to navigate around the center island and appliances. Natural light comes into the room from the high windows on the east wall as well as the remote controlled venting skylight. LED ceiling can lights are activated by a motion sensor and illuminate the room. Our home has lots of windows to take advantage of passive solar heating. We selected casement windows because the cranks are easy to operate, and the locks are reachable from a seated position. The first noticeable improvement when I moved into our new home was the ease in navigating on the hardwood and tile floors. My shoulders were no longer strained as they had been on carpeting. I realized that my carpal tunnel syndrome pain and numbness in my hands was lessened. The central vacuum system in the walls provides a much cleaner way to remove dirt from the floors. Dirt is sent through hoses in the walls into a canister in the garage. By not having carpet, there is a lot less dust in our home. I'm not sneezing and blowing my nose as often and my nose isn't stuffy at night. This could also be due to banning our cat from the bedroom by closing doors! The air filtration system uses a MERV 16 air filter which removes airborne particles. The clean air quality has also been preserved by not using paints, stains, and adhesives with volatile organic compounds that pollute the air. With 3500 square feet in the home and access to the 2000 square foot landscape paver area, I have plenty of room to walk with my walker. This gives me the opportunity for more exercise and weight bearing as I stand. The frequency of leg spasms is directly related to how often I walk and stand. As a result, I don't need to take anti-spasm medicine and get a good night's sleep. My muscles, bones and joints benefit from walking and standing. I've noticed a big improvement in my health since moving into our home. My husband, Mark Leder, and I didn't start out with intentions of building a national demonstration home and garden in Columbus, Ohio. The project evolved out of our frustration and housing needs due to a life-changing event. Our intension is to stay in this home for the rest of our lives. On June 13, 1998, our third wedding anniversary weekend, Mark and I went for a bicycle ride on a rural wooded bike trail in Granville, OH. After riding for a few minutes, Mark thought he heard a gunshot and slowed down to investigate. As he scanned the scene he saw a large tree falling. He shouted, "Stop!" But the warning was too late. Instantly, I was crushed by a 3 ? ton tree and paralyzed from the waist down. Coming home from the hospital in a wheelchair in July 1998 after my spinal cord injury, I realized how my home intensified my disability. I was unable to roll on the carpet; fit through bathroom doorways; reach the clothes in my closet; access food in the pantry; reach glasses and dishes in the kitchen; take a shower or bath independently; do the laundry; use the oven or microwave; get food out of the freezer; access any of the landscape; come and go out of any door independently; and get to the second floor or basement. My husband and I knew that we had to sell our home and find something more suitable. In September of 2004 we hired architect, Patrick Manley to draw the house plans for our new home. In January 2005, Mark and I were encouraged by our mastermind group to make our home a national demonstration home and garden and to acquire corporate sponsors. In January 2005 we hired kitchen and bath designer and internationally renowned universal design specialist Mary Jo Peterson. She worked with Manley on the kitchen, pantry, bathrooms, and wardrobe floor plan and positioned the cabinets, appliances, plumbing fixtures, and countertops. She also helped select these items. Anna Lyon, our interior designer consulted on the floor plans and elevations and selected lighting fixtures, paint, stain, furniture and finishes for the home. Ardra Zinkon was the lighting designer. The design team from KraftMaid Cabinetry refined the Passport series cabinet design throughout the home. Our design team focused on accessible features to accommodate me in my wheelchair including: knee space under the sinks and cooktop; 9" x 6" toe kick at the base of the cabinets; an elevator; countertop heights to accommodate me in all rooms. My husband is 6'4" tall while I am 4'1" seated in my wheelchair. Our heights and reaches were factors in the home design so that we were both accommodated. Mark and I bought an acre and a half lot in December of 2006 and continued with the planning and design process. We broke ground on September 23, 2009. In addition to being accessible, universal design and green building construction principles were followed. We followed the standards from three universal design national certification programs: Livable Design, Life-Flex Home, ZeroStep. On May 18, 2012 we moved into our new home. There are currently 188 contributors. Our home could not have been built without their support. Mark and I have personally funded the UDLL and served as the general contractors with Mark doing much of the work himself.